Last night the Madison Academy Knights boys basketball team lead wire to wire averaging 16 points per quarter. Three players scored in double digits: Joshua Mixon-12, Langston Martinez-10 and Jonathan Pedrero-10. The final score was 64-25. The win gives the team an overall record of 2-4. The Lady Knights also won their game too. The Lady Knights were behind for the first three quarters however they outscored FRC 26 to 14 in the fourth quarter and won 48-40. The team overall record is now 4-1. Tonight the boys and girls JV teams compete with Dayspring Academy. The girls game starts at 6pm. Please mark Friday, December 9th at 5:00 pm and Sunday, November 11th at 2:00 pm on your calendars. This is the weekend that we have the ladies and children from Nashville Rescue Mission here for our annual Acros Christmas party for them. If this is your first year here or you are not familiar with this event, we collect new toys for the kids and gifts for women (lotions, scarves, purses, coats, hats, gloves, shower gels, gift cards, etc.) wrap them on Friday evening and have dinner for them/Acros show/hand out gifts on Sunday afternoon. As you are doing your Black Friday shopping please keep this ministry in mind. We will have more details next week on some more gift ideas and creative ways you may be able to contribute to this awesome event! Stay tuned! Hope you have some plans to eat, relax and enjoy family! I just wanted to send out a quick thank-you to everyone who brought in cans and other non perishable items for our food drive. We dropped off over 1000 items to the 403 Center! They were surprised and overjoyed! As far as the class on class competition went, the Freshmen just held off the Juniors to win (305-279). The Sophomores and the Seniors finished 3rd and 4th respectively. Yesterday, in the JV game the game came down to the last shot. With 6 seconds remaining and the Madison Academy JV with the lead Hendersonville Christian Academy player 21 made a three point play to win the game. It was an exciting ending. The JV team is now 1-2 overall. The HCA Varsity boys team lead wire to wire. The final score was 74-53. The Knights overall record is 1-3. The Lady Knights won a close game 40-39. Jordyn Walker scored 17 points and Sara Adalla scored 14. The Lady Knights are 3-1 overall. The next game is away at Meroll Hyde tonight. The JV boys game starts at 4:30, the varsity girls at 6:00 and the varsity boys at 7:30pm. Last year when these teams met the varsity girls won and the boys lost. Last night the Lady Knights came back to win their game 28-27. The team record is now 2-1. In the late game the Knights lost to HCA 58-64. The boys team record is now 1-2. The boys jv team played and won 44-32. Their team is now 1-1 so far this season. The next game is a home game rematch with Hendersonville Christian Academy. 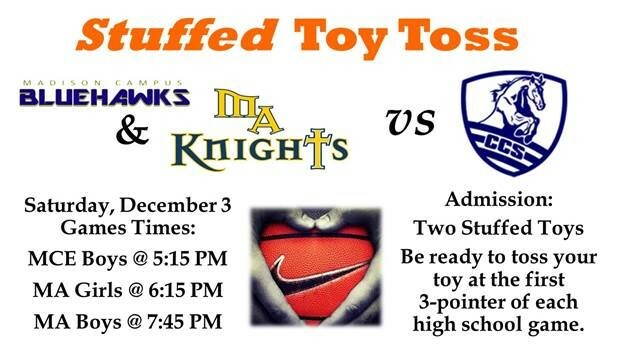 The boys game starts at 5:30pm and the girls game starts at 7:00pm. The boys JV plays at 4:30pm. Last night the Madison Academy Knights defeated the Pleasant View Christian Warriors in overtime 54-53. The game started slowly with the both teams scoring a total of 12 points [MA4, PVC8] in the first quarter. The Warriors increased their lead by half time. In the second half the Knights caught on fire and outscored PVC 18-6 in the third quarter lead by senior Josh Mixon. The final minutes of the game were intense as both teams stayed within two points of each other. The game ended tied at 44. In the overtime period, Josh Mixon sealed the win by making the second of two free-throws to give the Knights a four point lead. PVC continued to play hard and made a three point basket at the close of overtime. For statistics of the game go to MaxPrep. The Lady Knights played the late game and defeated the Lady Warriors 51-41. The Lady Knights started the scoring and lead the entire game. Morgan Currie was the high scorer with 24 points. MA Athletics showed it support of the school “CAN HUNGER WEEK” by asking for donations of canned goods in stead of a gate entrance fee. Alex Adams, Athletic Director, appreciated the willingness of the Pleasant View community to participate in this way. Over 100 items were donated. Both teams are now even at 1-1. The next game is an away game at Hendersonville Christian Academy. The girls game starts at 5:30 pm and the boys at 7:00 pm. We did not play Hendersonville Christian Academy last year. We have new HVAC units that have the adequate capacity to cool and heat our gym, but sadly we do not have adequate air circulation. 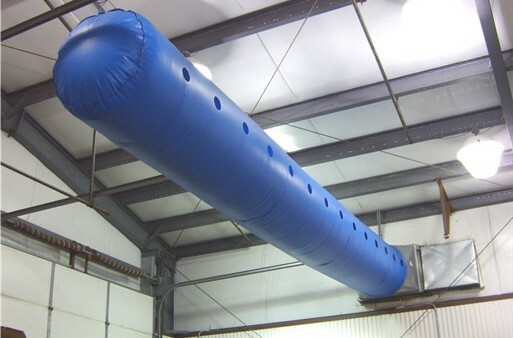 In order to complete HVAC system, we need to install an air duct sock system in the gym. A contractor has generously agreed to do this program at cost, but we need your help to raise $10,000! What is an air duct sock system? It is a long fabric tube (hence sock) that helps disperse and circulate air in large buildings. Why does Madison Academy need one if we have a new thermostat? While our heating and cooling system is not made to cool/heat and circulate the air in our giant gym. Not only do our sports teams use our gym to practice, but we have churches who utilize our gym, we hold events like graduation and festivals there, host church league games, and have summer sports camps for the community. Tennessee is hot and humid most of the year, and unless the air conditioning is circulated throughout the gym it keeps the inside muggy. Thanks to a contractor who will install the sock at cost it will simply cost of $10,000 to buy and install. By donating and spreading the word. You can donate a fixed amount by clicking the button. You can also come support our teams by coming to their home games, donating concession items, or joining our Booster club. Madison Academy accepted the invitation of the Madison Campus Elementary school students to come and visit each classroom to learn about different countries in the world. Each classroom was decorated and had the sights and music of the country. Students gave short explanations of the culture, animals, or language. It was delightful and all of the students presented and interacted well with the visitors.